The new version of Unigine Heaven tech demo and benchmark is out. The main feature of version 2.1 is the support of OpenGL 4.0 hardware tessellation. Yeah! The Direct3D 11 hardware tessellation was already supported in the previous version 2.0. 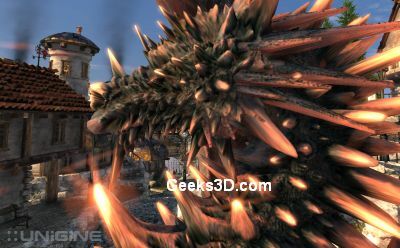 Unigine Heaven 2.0 Benchmark Available With More Tessellation! Have you got OGL 4 working on ATI? Mine freezes. Funny thing, when I first ran on openGL with ATI(5870), there was no tessellation, then I tried to install the beta driver -with openGL 4.0 support, but the setup notified me, that the driver is up to date. I ran the Unigine Heaven again and tessellation magically works! With or without tessellation, the game works slowly at the beginning, then I get 15-30fps on 1280-1024 and extreme tessellation(other default). with my Radeon HD5850 and Catalyst 10.4 OpenGL tesselation doesnt works too..
For OpenGL4 Tessillation support on ATI you need the opengl extension GL_ARB_tessellation_shader running on the HD5 series. This extension is available in ATI’s Final OpenGL4 under Cat10.5 WHQL or later. Nearly forgot. Cat10.5 with Full OpenGL4 support isn’t quite available yet, but coming very soon. But this could not bi the case, because I regularly update drivers, for developers too.